Total maxillectomy entails resection of the entire maxilla, including the orbital floor and the ethmoid sinuses. It may even extend to include zygoma and pterygoid plates depending on the extent of the lesion. The ensuing surgical defect results in an enormous oro-antral and oronasal communication. 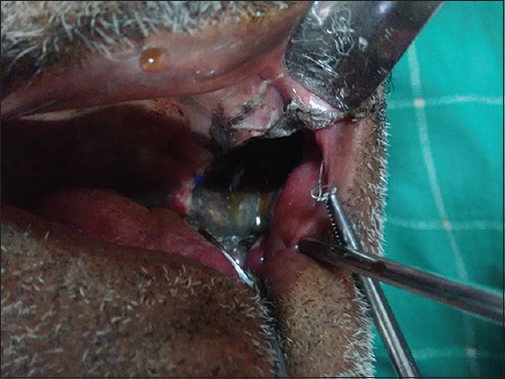 Prosthetic rehabilitation of these defects with immediate surgical obturator is of paramount importance in preventing post-operative complications such as mastication, phonation, deglutition and respiration and protects the surgical site during the initial healing period. This article describes in detail about the surgical technique used for retention of the immediate surgical obturator prosthesis (ISOP) for total maxillectomy and edentulous patients, as these situations are challenging due to the lack of any retentive abutments which could be used as in the case of segmental resection. Fill the defect with impression compound and fix the obturator with the retentive wires [Figure 3]a and [Figure 3]b. This is an easy way for obtaining retention in the initial healing period. The suspension wires can be untwisted and the ISOP is removed and debrided in the post-operative period [Figure 4]. The ISOP can be retained for a period of one to two weeks as advised by the surgical oncologist. The suspension wires can be removed at a later date under local anaesthesia as a chair side procedure. For the obturator prosthesis, retention must be defined as both resistance to displacement along the path of insertion and resistance to the rotational displacement out of the defect due to the force of gravity and function of the surrounding tissues around the obturator. In edentulous and total maxillectomy patients, retention can be acquired with the help of palatal bone screws, screw-shaped titanium implants, sutures into the surrounding mucosa and suspension wiring such as circumzygomatic wiring. The problem ascends when the patient has severe bone atrophy where it does not permit placement of implants or screws for the retention of the ISOP. In such circumstances, fixing the ISOP using circumzygomatic wiring is the best option and no special instruments are required and the cost of the materials needed are relatively lesser for this technique when compared to implants and screws. Johan Fagan: Total Maxillectomy and Orbital Exenteration, Open Atlas of Otolaryngology, Head and Neck Operative Surgery. Available from: https://vula.uct.ac.za/access/content/group/ba5fb1bd-be95-48e5-81be-586fbaeba29d/Total%20Maxillectomy%20and%20Orbital%20Exenteration.pdf. [Last accessed on 2018 Aug 11]. Omondi BI, Guthua SW, Awange DO, Odhiambo WA. Maxillary obturator prosthesis rehabilitation following maxillectomy for ameloblastoma: Case series of five patients. Int J Prosthodont 2004;17:464-8. Iqbal Z, Raza Kazmi SM, Yazdanie N, Mehmood Z, Ali S. Maxillary obturator prosthesis: Support and retention case series. Pak J Med Sci 2011;2:394-9. Rizzo R, Maglione M, Tofanelli M, Tirelli G. Immediate obturator stabilization (ISO) in severely atrophic edentulous maxilla: Suspension wiring technique. Am J Otolaryngol 2016;37:125-7.